Anyone reading my blog, and most everyone who know me, also know about my propensity to hoard books. Specifically second-hand ones. In fact, if I take the time to look for them, I'd probably find any number of blog posts talking about this, and how it takes a lot of effort for me to stay away from book shops for fear of spending too much on books (like what happened this time). Most of the time though (98% of the time), I do not regret shelling out the money. I find solace in reading. When I'm in a bad mood, or a bit out of whack, or just bored, books keep me company. My copy doesn't actually have this cover :( It was hard bound and cost half as much as what a paperback copy would have. It's my first Le Guin book. I read one of her short stories back in College but I can't remember the title. I think it's the one with Mr. Underhill. :S Anyway, I just knew I would like her writing, and I wasn't wrong. Set in the city of Ansul, Voices tells the story of young Memer who was born in the year that her city was occupied by foreign troops. The invaders have banned books for their demonic nature, and because Ansul was the seat of learning it was especially ravaged and its great university was torn down. All the books that the Alds could gather were burned and those who possessed them were persecuted. The head of Mer's household, the Waylord, was among those who were thrown into prison and tortured. I can't ever imagine living in a world without books! I guess though, if you grew up without them, then you don't know what you're missing. The people of Alds relied on Makers, storytellers, like Orrec. He travels far and wide not only to tell stories, but to learn them too. Much like how our ancestors kept culture alive, by passing on our stories by mouth, so does he. 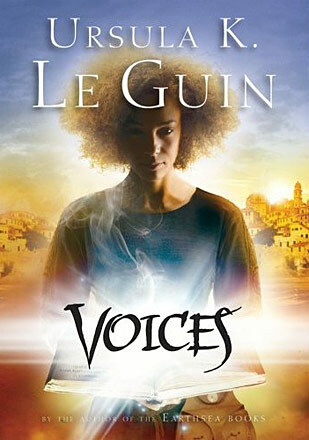 Only by the end of the novel did I realize that Voices was part of a series. It definitely stands on its own, but I would be very interested in finding a copy of Gifts too, along with Powers. And you know what? If I find a copy of The Wizard of Earthsea, I'd definitely buy it.